April was a great month because I finally finished off The Dresden Files so can move on to other, more varied reads! Since the March update, I've read books 13-14 of The Dresden Files, plus Side Jobs, the short story collection. I'm currently about halfway through The Casual Vacancy by J. K. Rowling. I'm not really sure what I think about it yet. There were a lot of characters introduced really quickly and I'm still finding it hard to keep track of who's who and on what side of the main conflict they fall. Like many others, I picked up this book because I'm a Harry Potter fan and I was excited to see what Rowling could do in a different genre and with a different target audience, but to be honest I'm not impressed so far. Once I finish reading I'll do a review. I'm currently sitting at 18 books read for the year which is back ahead of my reading goal. I'm really loving how much I've gotten back in to reading because of these twin challenges and thanks to Goodreads. Finally I've got my reading mojo back and I'm loving it! 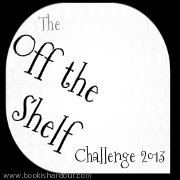 One thing I am struggling with though is that because of the large number of books in my Off The Shelf challenge, I don't really have the wriggle room to read other things that I might want. I'm a notorious re-reader, which is partly why I took on the challenge in the first place, but sometimes I just want to read something familiar. I'm meeting that need currently by listening to the audiobooks of the A Song of Ice and Fire series...but I have less than an hour's listening time each work day, and these books are looooooong - A Game of Thrones is nearly 34 hours, and that's the shortest. In fact, I just did a quick calculation: at this rate it's going to take me the rest of the year to listen to the series. Longer than this year even. Eeep. I also don't have much room to squeeze in other books that I want to read if they come up. For example, there will almost certainly be another book in The Dresden Files out later this year that I'll have to fit in. My plan right now is to blast through as many of my Off The Shelf books as quickly as I can, so I have spare time towards the end of the year to read other stuff. So far that's working well, but I haven't really started reading the non-fiction on my list, and that tends to take me longer to read. Still, I'm meeting my goals for now, which is great, and really enjoying using Goodreads to see what others are reading and enjoying. If you love reading, you should join Goodreads too! Yay! I'm loving the challenges too. Like you, I've found my mojo again too.